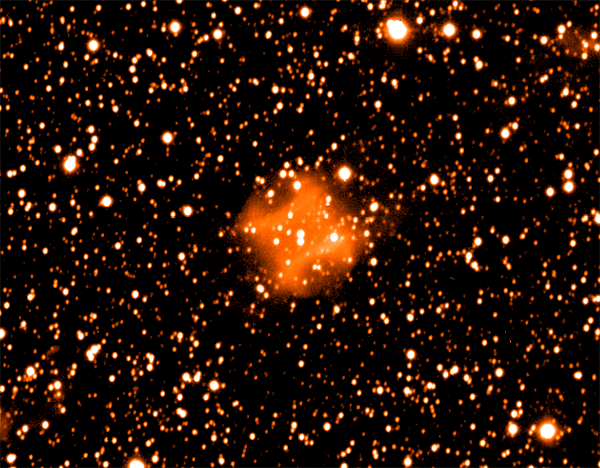 Image of the planetary nebula Abell 63 in the light of Hα+[N II] taken using the Wide Field Camera (WFC) on the Isaac Newton Telescope (INT). Credit: David Jones (Instituto de Astrofísica de Canarias). Large format: PNG. Planetary nebulae are the glowing shells of gas and dust surrounding newly emerged white dwarf stars. As described in a Nature Astronomy Review by researchers from the Instituto de Astrofísica de Canarias (IAC) and the European Southern Observatory (ESO), the formation of their highly aspherical structures can currently only be understood in the context of a binary star scenario, where the influence of a companion star helps shape the mass lost by the nebula progenitor. Abell 63 was the first planetary nebula to be shown to host a binary central star, and has since been shown to be an archetype system. 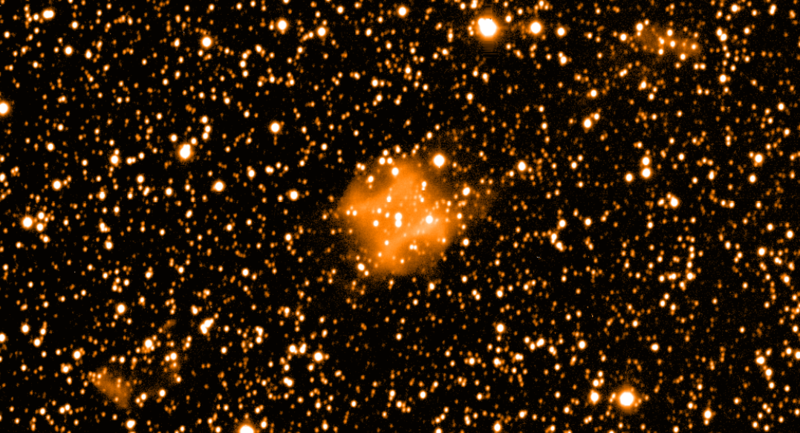 This image taken with the WFC shows the nebula to comprise a central barrel-shaped structure along with two caps of emission ejected along the major axis of the central nebula. These caps have since been shown to be older than the central regions by around 1000 years, probably forming via an episode of mass transfer between the two stars at the nebular centre before the central barrel was itself ejected. Further evidence for this mass transfer was discovered by combining observations from the Jacobus Kapteyn Telescope and the William Herschel Telescope to show that the companion star in this system has been inflated to nearly twice its normal size. This inflation is almost certainly a result of the rapid mass transfer from the primary star knocking the companion out of thermal equilibrium. In recent years, it has become clear that the aforementioned properties of Abell 63 and its central stars are shared by a great many other planetary nebulae with binary, and may hold the key to understanding the exact role that binary interactions play in forming the plethora of shapes observed among planetary nebulae. S.A. Bell, D.L. Pollacco and R.W. Hilditch, 1994, "Direct optical observations of the secondary component of UU Sagittae", MNRAS, 270, 449-456 [ ADS ].